Maxi Haulage has taken its first delivery of 40 unique double deck trailers from Tiger Trailers, featuring a ground-breaking design that will transform productivity for its customers delivering to the Republic of Ireland. The new 13.6-metre tri-axle, step frame fixed double deck trailers will be used to transport retail cages between the UK and Ireland. Tiger Trailers was tasked by Maxi Haulage to develop a solution that would offer a completely flat lower deck whilst also meeting the 4.65-metre Irish height restrictions – believed to be the first time such a combination has been successfully achieved. Tiger’s innovative design also saw it move away from independent suspension, the only way such trailers were previously able to run low enough. This made them significantly more likely to sustain damage, which in turn increased running costs. These low-running trailers also made ferry loading and unloading much more difficult, so Tiger and Maxi Haulage consulted the ferry companies during the development stage to ensure the new design would simplify the process. In addition to the flat deck, Tiger also worked hard to include other bespoke elements in the design, including gates on the neck of the trailers to help secure all available load space and a sloping rear floor to make loading and unloading as easy and efficient as possible. The new double decks will join a fleet of 635 different trailer variants currently in operation for Maxi Haulage across the UK and Ireland, seven days a week, all year round. 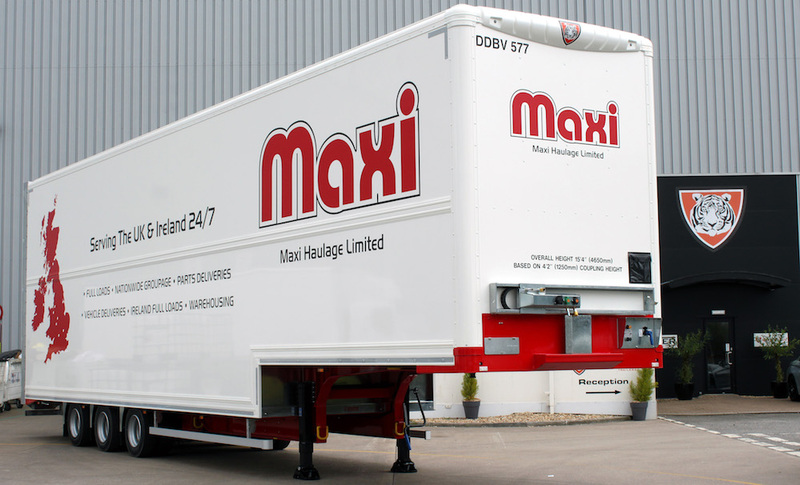 Maxi Haulage has been providing haulage, distribution and logistics services for more than 40 years and the addition of the new Tiger Trailers double decks has cemented its reputation for being at the forefront of new transport solutions.